If you’re looking for a more personable tour, our small group tours are the perfect fit. With a maximum of 17 guests on each tour, you’ll get more one-to-one time with our professional guides and the chance to explore the world-famous landmarks at your own leisure without the big queues and waiting time for getting on and off the coach. 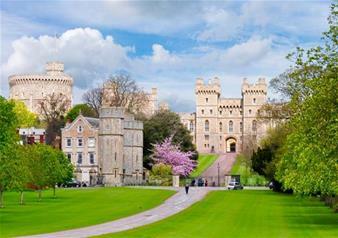 Have a quintessentially British adventure in the royal town of Windsor. Home to Queen Elizabeth II’s favourite royal residence, Windsor Castle, this town is bursting at the seams with history to uncover. You’ll have the chance to explore at your own leisure with free time to visit the delicious eateries, independent boutiques and walk the iconic cobbled streets of Windsor. Soak in views of the River Thames, Windsor Castle and much more as you adventure through the town. The last stop on your small group tour will be the UK’s most mysterious landmark – Stonehenge. For thousands of years, people have tried to work out how these famous stones came to be. Do they represent an astronomical clock? Or are they standing on an ancient burial ground? See if you can piece together the evidence with your visit to this 5,000 year old monument on Salisbury Plain. Enjoy audio commentary throughout and entry to the Stonehenge Visitor Centre.